In the heart of winter, we prepare for what blessings are to come. 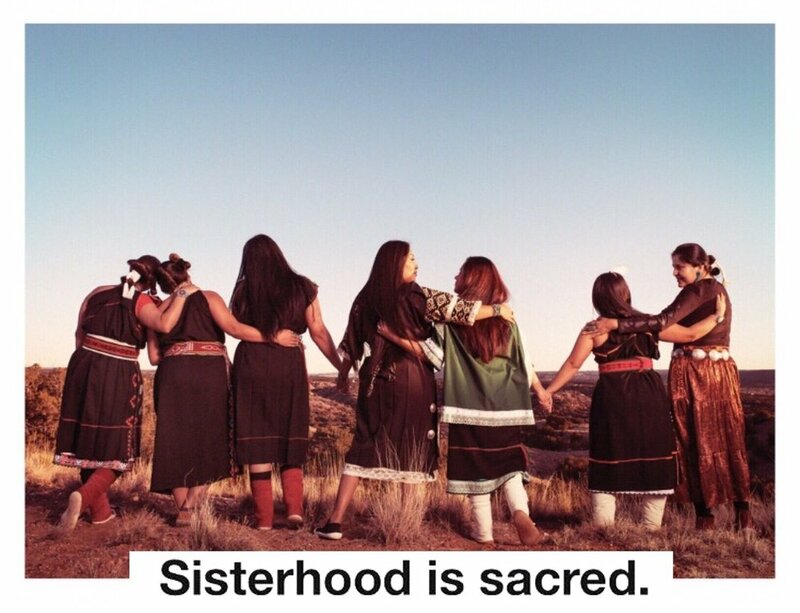 We take all of the knowledge, growth and insight we have received over the first year cycle with Indigenous Goddess Gang, and we hold these lessons close to us as medicine. We take time to reflect, to sharpen our skills, to rest, to love and be loved, to tell stories and to nurture our spirits and bodies. We are making ready for what is to come, we are in preparation for the gifts ahead. This issue celebrates the power of hibernation, reflection, grounding and preparation for what will come. Let us acknowledge our blessings, stay focused on our goals and continue to get strong in Preparation for the work ahead. Issue 9 brings us back to our center, nourishing our minds, spirits and bodies for the year to come. Our Fashion feature is Orenda Tribe. Thru Indigenous Lens spotlights the Founder of Orenda Tribe, Diné Goddess Amy Yeung. We welcome Choctaw/Chickasaw artist, writer, and organizer Amber Morningstar Byars to the gang, with an introduction to her upcoming series Tough Topics. We also welcome Diné writer Nicole Lefthand who provides insight on protecting your energy from narcissists in her new section Heart Medicine. Our Goddess section honors the life of the prolific Eastern Band Cherokee artist Shan Goshorn who recently joined the ancestors, Rest In Power Sister. Indigenous Midwifery features Placenta & Umbilical Cord Ceremonies: Ancestral Knowledge in a Contemporary World by Indigenous Midwife Nicolle Gonzales. Land, Water, Dignity feature is Winter Medicine for Rooting Down and Healing Burn Out, a must read this season by Jade Begay. Healing My Body Is Healing The Land presents No More Stolen Sisters, a powerful collection of information and essays by Kim Smith. Seed Keeper’s Harvest spotlights the work of Santa Clara Pueblo based project Flowering Tree Permaculture Institute, highlighting the work of Director and Matriarch Roxanne Swentzell. Sacred Moon Cycles gives insight on herbs and other self care tips to reduce excessive pain during moon time. In our Food Medicine section we welcome guest chefs Well for Culture who bring us a super delicious Manoomin Elk Meatballs Recipe. Music Medicine spotlights the sounds of Indigenous Ethereal Doom/Post-Metal/Folk Noir trio Liłith. Word To Your Mother features the poem Glory by Sonia Guinansaca. Dear Patriarchy welcomes guest author and accomplice Freyr A. Marie with their essay Why Do You Have To Go And Make Things So Complicated?. A Tribe Called Beauty features an in depth look at Inuit tattooing in Tribal Tattoos Series, Part II. Self Care Medicine features the poetic essay In An Era Of Super Fires by Young Yarrow. And Indige-SLAY gives a pro tip on keeping your skin glowed up this winter in Dirty 30 DIY Grown Folx Face Mist. Our final highlight for Strong Womxn is For the Wild, a dream team whose work focuses on land based protection, co-liberaton and intersectional storytelling rooted in a paradigm shift from human supremacy towards deep ecology. We also have some amazing new merch up in our Goddess Shop to get geared up while supporting your local Goddess Gang! From this point forward, we will be releasing our online publication seasonally. We are humbled to continue to share the work and medicine of so many incredible Indigenous Goddesses from across Turtle Island on this platform. Thank you to all the contributors and the medicine shared in our first year cycle, we look forward to all that is to come!